Come back often to keep updated! LDS leaders seem more concerned about bringing people back into the Church more than they are about leading people into a relationship with the Lord. Mormon grace falls way short of biblical grace! What people sat around talking about grace in 2200 BC? The Church said Jesus died because he knew we’d have heartbreaks in life. How can this be true when His word said Jesus came to pay the price for our sins? We’re wondering why the Church doesn’t believe the three passages of scripture they used in their message this month. Do they do this to mislead, or are they so misled they don’t realize their mistake? Why didn’t the Church talk about Jesus in this month’s VT Message? On October 1, 2017, Mormon apostle, Robert D. Hales, died due to age related incidents. For the first time in almost thirty years, the LDS Church has ex-communicated a General Authority. After a disciplinary hearing, James J. Hamula, a member of the Seventies, was officially ‘let go’ of his duties. Mr. Hamula was originally called to his position in 2008. The odd thing about all of their statements is how none provided a picture of true Mormonism. Mr. Eyring’s talk included the message that people could experience true peace by knowing the ‘Sacramental Prayers’ offered during priesthood blessings. We’re wondering…what happened to the peace Jesus said He’d give to us? Thomas Monson told Mormons they should follow in the footsteps of their Mormon ancestors who were pioneers of the faith. The Church listed six different names and titles for Jesus and not one of them was correct! The Church’s new policy of not baptizing children of gay couples raised serious questions about their policies leading to a mass exodus. On July 3, 2015 Boyd K. Packer died due to age related incidents. Just as the Israelites lusted after the magical powers of Simon Magus in the book of Acts, Mormons ascribe to the same ideologies with message of Henry Eyring. Looking for extra-biblical miracles, they ignore the word of God and shun it away. Why does the Church lie about their beliefs? They’ve reported that they don’t believe men will have their own planets someday…hmmm… This goes against everything they’ve ever taught! 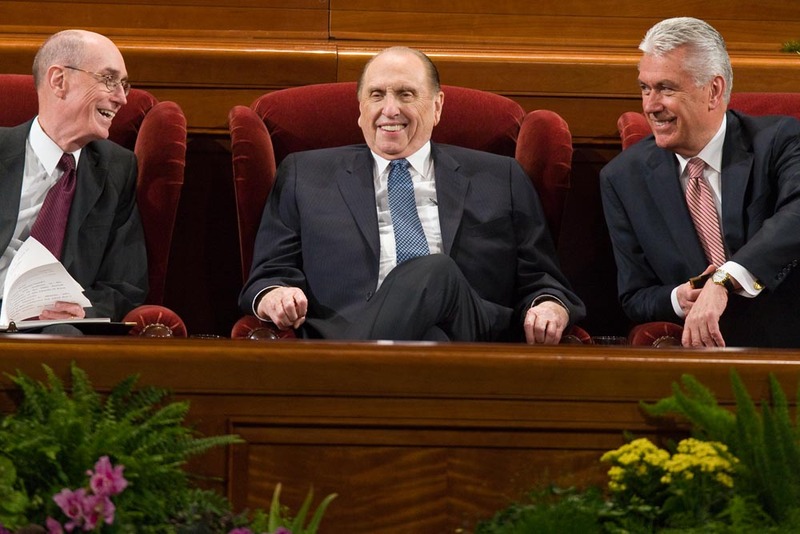 This month the prophet Thomas Monson declared it’s the responsibility of all church members to “rescue” inactive Mormons and bring them back into full fellowship. What if they don’t want to be rescued and why are the Mormons given just one more thing to do on their endless list of must-dos to be saved? A look at why the Church uses pictures of false gods for the kids’ learning activity to thank God. Joseph F. Smith writes letters to the Deseret News & the London Times denying that neither he, nor anyone in the Church had been practicing polygamy since he had been called into office in 1902. Speeches given by Russell Ballard (2/2016) shortly before his death, and Jeffrey Holland (4/2016) exhibit fear in the declining LDS population. They’re emphasis to Mormons: don’t use the internet to find historical info on the Church. In a speech given by Richard Bushman at the BYU Campus in Hawaii, members were told they need to anchor their testimonies on Jesus, not Joseph. This stunning comment comes five months after his presentation to a small group of Mormons stating, ‘the historical narrative the LDS Church has been teaching for decades is not true’. This should give pause to all interested parties of Mormonism!